Last fall, we replaced a section of Highway 19 concrete median barrier with an emergency access gate – also known as a Vulcan Barrier (please excuse any ensuing Star Trek jokes) – the first on Vancouver Island highways (Spock would be so proud!). Other types of emergency gates can be found in some parts of the province, such as Kelowna and the Alex Fraser Bridge in Delta. When an incident closes a BC highway, redirecting traffic via detour is the only way to keep travellers and goods moving to their destinations. But when there are no alternative routes nearby, everyone’s stuck. 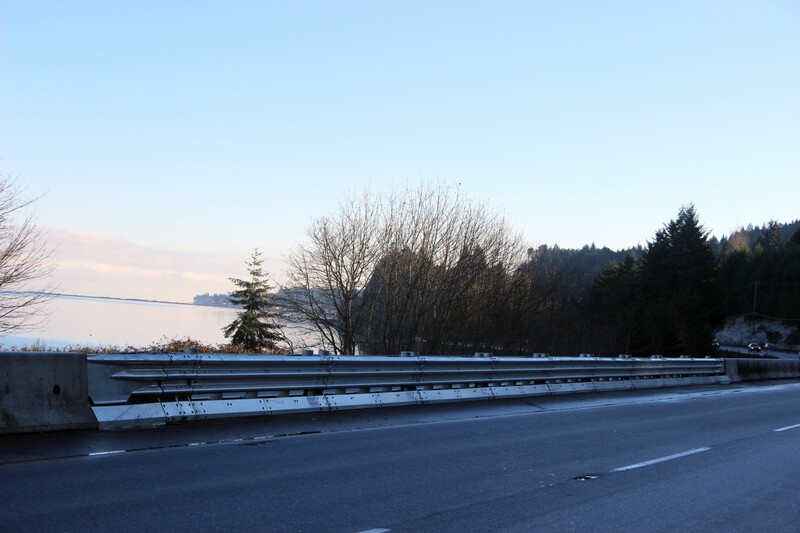 One “detourless” section of highway is on Highway 19 north of Nanaimo. The section between Rumming and Summerset roads (known as Nanoose Flats) sees about 30,000 vehicles per day, but there are no side roads available to redirect traffic, which means we have to consider splitting the opposite two lanes. Thing is, the lanes are divided by concrete median barrier designed to prevent head-on collisions. Any good Vulcan would surely agree that trying to direct traffic through concrete barrier designed to block vehicles is highly illogical (sorry, couldn’t resist). The combination of high volume and no detours has left travellers stranded for hours during closures in recent years. After talking to local government and police as part of last year’s community safety enhancement program on Vancouver Island, it was clear something needed to be done. Hence, the gate – pure logic, right? When the highway is closed in one direction, emergency responders can allow your car to boldly cross the median through the open steel gate, and travel on one of the two lanes on the open half of the highway as part of a temporary counterflow traffic system. On March 17 2016, we teamed up with our maintenance contractor Emcon Services, local RCMP and firefighters to test the gate. RCMP also used the test as an opportunity to conduct a Counterattack roadblock for impaired drivers. It takes about 90 minutes to set up traffic control, open the gate, and have counterflow traffic moving, and the same time again to revert traffic back to normal. So, the gate will be used when we anticipate longer closures. Of course, we hope the gate won’t have to be used much at all; but in case of emergency, there’s now a way to keep people and goods moving. Highly logical, is it not? Oh to have 4 lanes on the Trans-Canada through the mountains. I lost count of the number of highway closures I have worked on for MVIs a long time ago. Since the coroner and RCMP accident reconstruction specialists aren’t local a fatality usually means at least a 6 hour closure with no diversions. I hope there are some of these on the Port Mann bridge…. There are a similar type of gate on the Port Mann Bridge in that they have the same purpose and function the same way, but they are from a different manufacturer. The gates on the Port Mann are called “armorguard gates”.